In the next two chapters, you will receive a detailed introduction to your technical toolbox. Every professional has his own working tools and so do Forex traders. Our toolbox contains a variety of analytical tools. These tools are helpful for efficient, professional technical analysis (which at the same time in many cases supports fundamental decisions). Remember: Toolbox is usually in the “Tools” or “Indicators” sections on top of the charts. The most popular technical indicator among Forex traders. Dear Fibonacci was an Italian mathematician (although his name sounds more like a type of pasta), who discovered existing ratios and patterns of number sequences. By dividing a number by its sequential, we obtain a ratio of 0.382. This ratio is our Retracement Level when using the Fibonacci indicator strategy. You will soon figure out what we are talking about. In order to understand Fibonacci, you need to understand what this tool examines: have you ever asked yourselves why prices do not move in a straight line? Why are they so frantic? Why do they move all the time, changing directions? 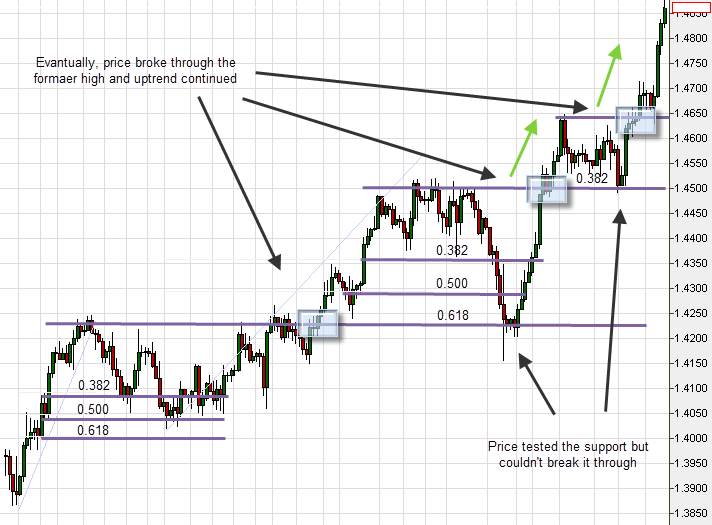 Prices move in motions that mimic waves. It is impossible to explain each and every price movement because there are too many of them, but explaining general price movements is another story. Prices always move in trends – waves! While the fundamental approach tries to explain long-term trends, we are going to focus on shorter trends. Sometimes, they can be completely explained using technical tools. The trend is made up of three waves. It has a general direction (in this case- up), but along the way, a sudden drop takes place, before moving back up again. This drop is called “pullback”. Fibonacci examines pullbacks. Pullback (Corrections): Prices drop following major bullish trends. A pullback is characterized by a relatively minor sequence of bearish bars, before prices move back up. Pullbacks are excellent entrance opportunities to utilize market conditions. The big challenge is to decide, in real time, whether the trend on the chart shows a correction (pullback) or a change in the trend’s direction and the beginning of a price decreases. It is hard to make a real time decision under such terms. However, we can think of an extremely helpful tool for these exact conditions. Guessed it? Fibonacci to the rescue! 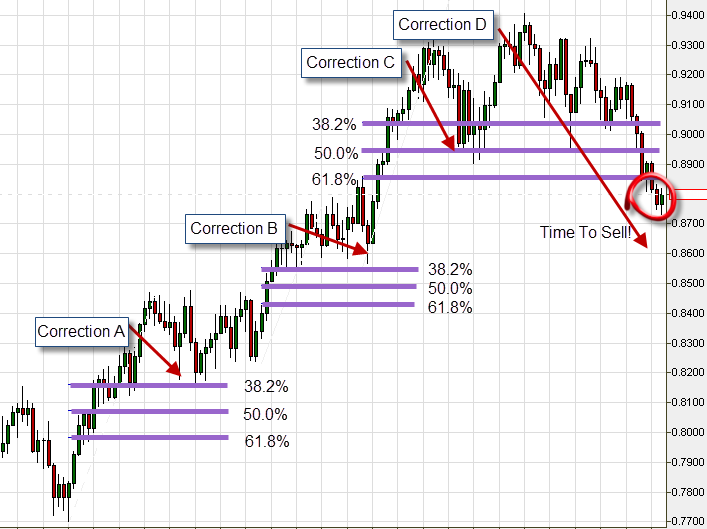 Fibonacci helps us determine the extent of the correction. Two other ratios worth remembering are 0.764 and 0.236. Important: You do not need to do any calculations at all! A trader’s life is easy – the trading platforms calculate it all for us, presenting the ratio lines themselves. 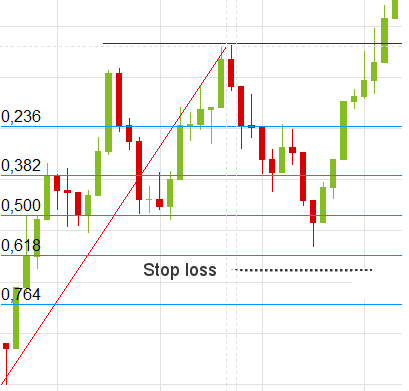 All that is left for you to do is to use the Fibonacci indicator, which you can find on the top left side of the MT4 platform, see how the lines that represent the ratios fit on the chart and finally, make a trading decision! Ratios actually serve as support and resistance levels. In other words; buy and sell levels. Fibonacci levels form when market forces respond to pullbacks. Fibonacci ratios are lines drawn on the chart. These ratios help us decide if a reversal is about to form, pulling price back to the original, general trend. Important: Fibonacci is most effective in volatile markets, with many trends. You can see a massive uptrend, with a correction that starts at the trend’s peak. 0.382, 0.500 and 0.618 are the three ratios presented on chart. The correction is located just above 0.5 (plus a couple of shadows at 0.618). This is a healthy status, signaling to prepare ourselves once again for a bullish trend – an uptrend. If the price goes beneath the 61.8% level, the correction will not be clear, meaning, there is a high probability of a downtrend coming. In this case, we will not enter a trade, expecting the price to go up, but rather treat this correction as a selling signal, with good chances for a bearish trend to develop. 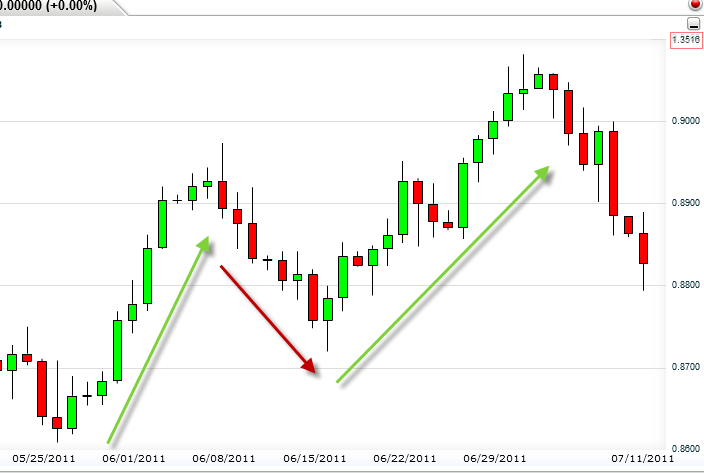 Notice the two corrections forming on the forex chart above (EUR/JPY). 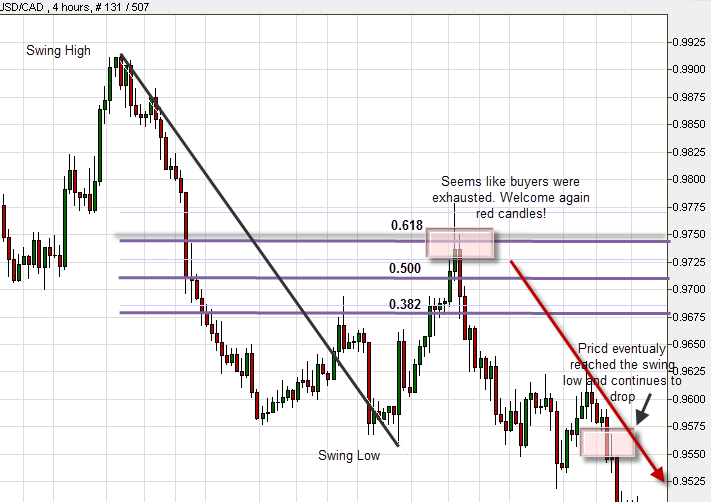 The first correction goes down to 0.500 (With a slight tendency to 0.618), and the second goes down to 0.382. In both cases the price went back to going up, continuing the general uptrend. 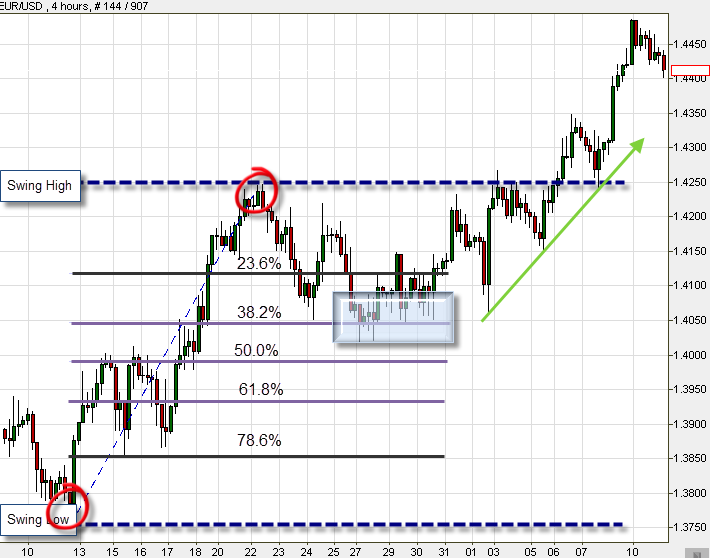 You can see that the first pullback (Correction A) touches the 38.2% retracement line, and the trend continues. Second pullback (Correction B) doesn’t even get near the Fibonacci lines, and the trend continues. The third pullback (Correction C) reaches 50.0%, and turns back up. At last, the fourth pullback (Correction D) cuts across all the Fibonacci lines, going below 0.618. It is time to SELL! You can observe all Fibonacci ratios on the chart. The trend begins at the Swing Low (Current trend’s bottom point). 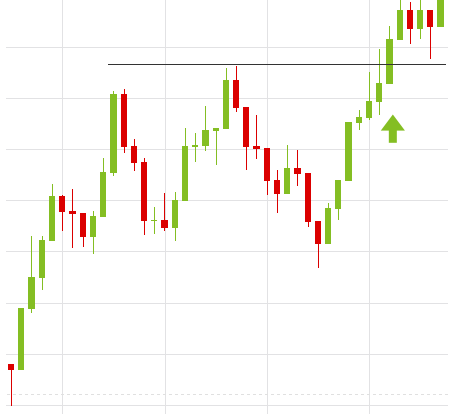 When the trend reaches the Swing High (Top point), a pullback starts, going all the way to ratio 0.38. At this point we witness a reversal, again. Is there anything we can conclude from this? Of course! 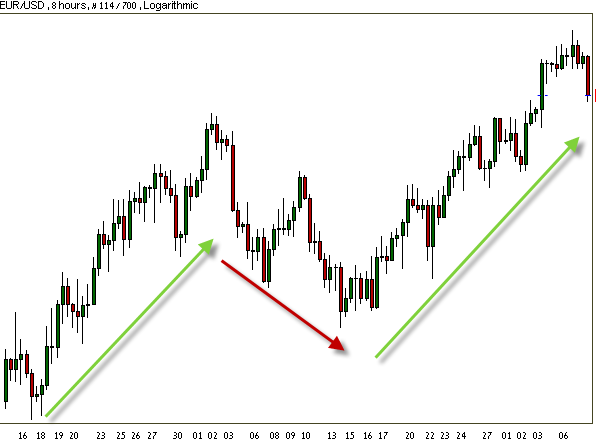 Switching back to the original uptrend = a fantastic entrance point. Trade is a collection of probabilities. With Fibonacci’s help you can significantly increase your odds Obviously, you are not the only one watching the charts in real time. There are thousands of traders looking at the exact same, live chart, thinking about the same position, wondering what to do next. Likewise, many other traders notice the supports and resistance levels, and like you, they will probably buy or sell, according to signals arriving from the market. This is why there is a high likelihood that the market will act like you! Let’s begin with the first chart. 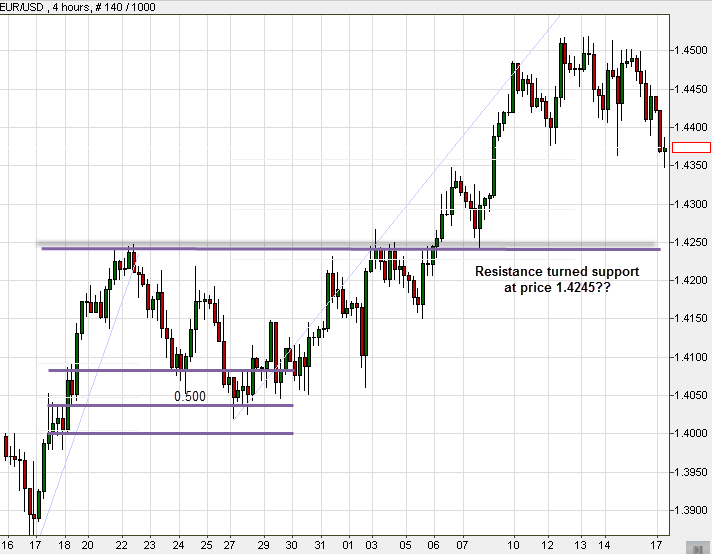 You are looking at an uptrend, meeting a resistance at 1.4245. Correction starts there and stops at price 1.4030, followed by returning back to the original bullish trend. This time it breaks resistance with its powerful way up, until its new Swing High, where the price stops, and again starts declining. The question is, to which point? What is going to happen next? 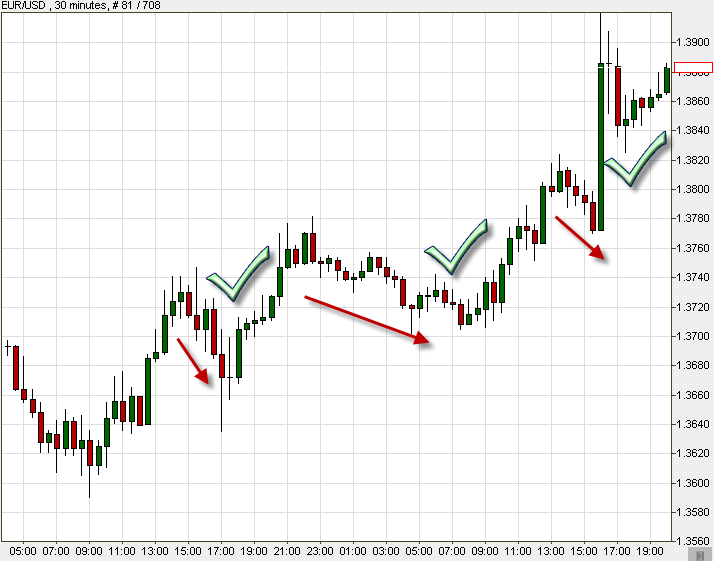 Second chart: Remember what we taught you in the previous chapter – Technical Forex Trading Strategies? In many cases, after having been breached, support levels turn into resistance levels, and vice versa! This also happens with moving averages trading strategy, as you will see in the coming chapters. If you guessed right, well done! Back to our example, you can see that 50% ratio used to be the previous resistance level, before the price broke out and moved up. Now the price starts to correct itself. It drops, breaking 38.2%, reaching 50%, stops and there is a change of direction! You can clearly see that it tries to break this level twice more without success. We are witnessing our new support level! It must be a good entrance point (unless you have already opened a position, in which case leave it open!). Finally, you can see that price has also succeeded in breaking the current resistance level, and what have we got? A massive, sharp uptrend! Hurray! There are tons of opportunities like this each and every day! You probably figured out already that we love using Fibonacci’s services. The main reason for this is that the ratios’ constancy on which this tool works is highly reliable. What does this mean? It means that smart use of this tool can dramatically raise our chances to leave a session with profits! Fibonacci works best in times of high activity (Trendy market). Therefore, it makes sense that it works fantastically together with trend lines. We need to pay attention to trends, to identify them. You constantly need to remember that if trends are sticking out, you are probably not the only one to notice them. Other traders are probably watching them too, this is a good thing! Important: Don’t get confused. Fibonacci is a fantastic technical indicator, but it is time to remind you that there is no indicator on earth that works 100%! There are going to be occasions when we will have difficulties to determine which points are Swing Lows and Swing Highs (in other words, when does a trend begin and when does it end?). Each trader is unique, with a view and commentaries of his own. Each trader analyses the charts a bit differently. That is why we recommend using it together with one of the additional technical indicators you are going to learn about in the next lesson. After all, it is a bit of guessing game. Our goal is to increase probabilities for successful guesses as much as we can. That´s why we advise that you add other technical indicators when you use the Fibonacci retracement levels and mix it with the fundamental analysis as well. To sum up: We can honestly state that Fibonacci is our most highly recommended indicator. Its accuracy and prediction capability are high; it is very reliable; it is easy to integrate with other technical indicators, and it makes it easy to spot levels and trends, such as supports, resistances and reversals. 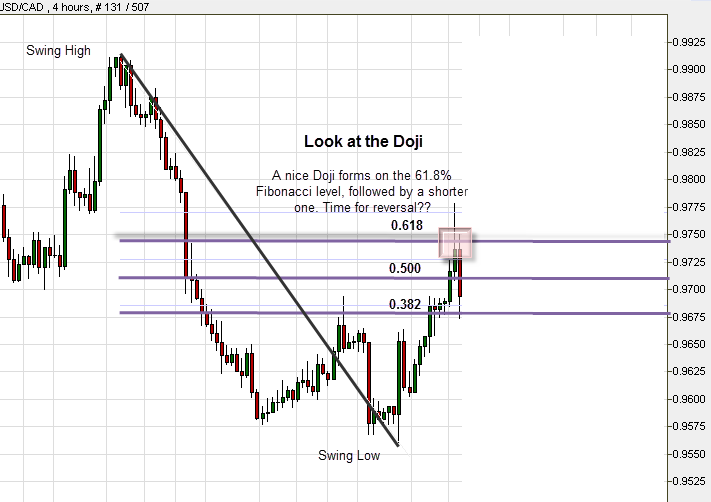 Find Fibonacci on the platform (look for the technical indicators tab at the top of the chart). Click on the indicator and then click at the ‘swing low’ of the price. Hold and drag the cursor to the swing high. Discover how it appears on the chart. 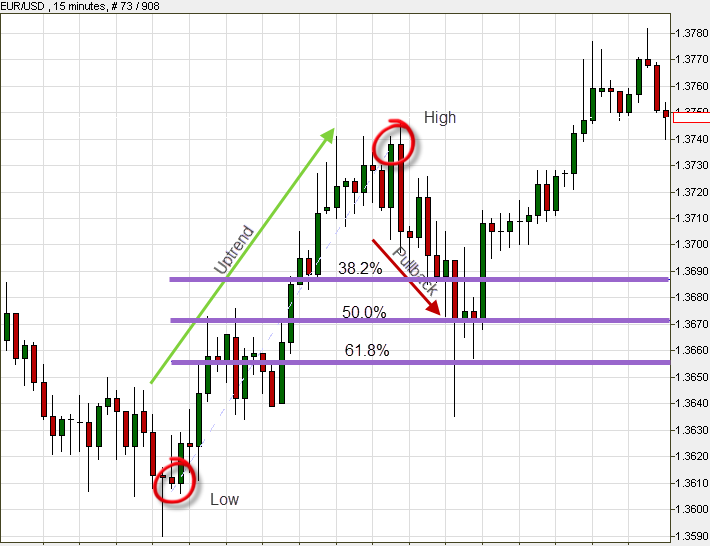 Identify the main ratios on different kinds of charts and time frames. With the help of Mr. Fibs, try to guess the point at which a reversal trend will appear. Add Trend lines to the chart. Play with them a bit and try to open demo positions. 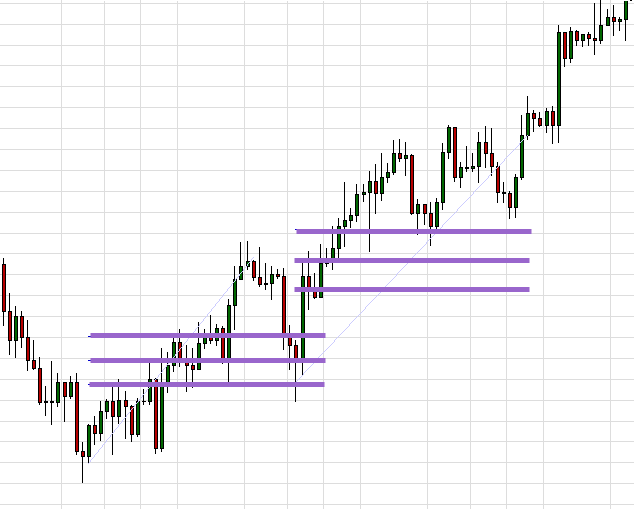 Draw these three levels on the following chart. Where would you set your Stop Loss order? In Chapter 8 – More Technical Trading Indicators we will learn about additional technical trading indicators that will assist you in becoming a more proficient trader.